The number of managerial sackings in the top four divisions has reached its highest level in 13 years, according to the League Managers' Association (LMA). Its latest figures show 47 bosses have been dismissed so far this campaign, the second highest level since the Premier League began 21 seasons ago. 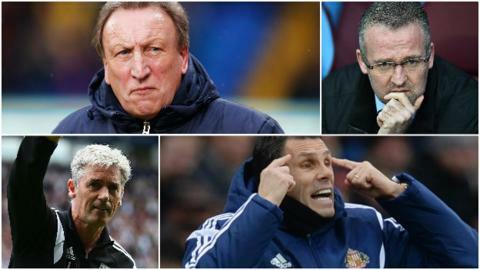 A record 20 Championship managers have been sacked this season with 150 coaches also losing their jobs overall. LMA chief Richard Bevan said the figures were "very concerning". "We don't want owners thinking this a casino," he added. "It's not stick or twist, sack the manager and let's see if we can get up a couple of places into the play-offs." Five Premier League bosses have been fired this campaign, compared with the 12 sacked last season, which Bevan said was positive. READ MORE: Does bad hiring lead to too much firing? Twelve managers have lost their jobs in League One, with 10 in League Two. Bevan told BBC Sport: "[Overall] in addition to the 12 resignations, this has affected about 200 families - it's an awful lot of people who have lost their jobs in a season. "Six people sacked are back in work so it's not really the merry-go-round which many people call it. "The figures highlight the complexity and volatility of being a manager. It makes it a very difficult environment to build a long-term winning cultures." Among the 20 managers sacked in the Championship, Leeds have accounted for four before appointing former Wigan boss Uwe Rosler on 20 May. Watford, who were promoted to the Premier League as runners-up, have had four managers in charge. Bevan said the current tenure of those employed in the second tier was about eight months. And the demand to reach the top flight, where a new record £5.14bn TV deal is set to begin in 2016, had led to clubs hitting the "panic button" too quickly. Clubs can earn £120m for reaching the Premier League, which includes parachute payments should they be relegated back to the Championship after one season. "What they need to do is look at Leicester," he added. "When Nigel Pearson took over, I think they were 12th in the Championship and they gave him the confidence and resources, they didn't isolate him, and he got them into the Premier League." Bevan also said there needed to be improvements to the managerial recruitment process, which had been "non-existent". And he backed former West Ham boss Sam Allardyce, whose contract was not renewed at the end of the Premier League season, despite leading the Hammers to 12th place. "Sam did a fantastic job, he is immensely talented, very forward thinking and has managed over 900 matches," Bevan said. "If you decide that Sam is not your man, you have to ensure that you don't follow in the footsteps of Bolton, Blackburn and Newcastle." Newcastle ensured their Premier League survival on the last day of the season, while Bolton and Blackburn both slipped into the Championship after Allardyce had been in charge. Does bad hiring mean too much firing? Read more on Manager sackings: Does bad hiring lead to too much firing?